I was equally astonished, since it never occurred to me that my morning routine of years could appear ‘boring’ to someone else. To tell you the truth, I badly need coffee first thing in the morning – of course, things have changed in the interim period – I have switched from coffee to tea! As I need my hot cup of tea early in the morning, it is only natural that I enter the kitchen to make tea. When I open the front door to pick up the news paper and milk, I have never paused to give the quintessential Aavin sachet a second look. How amazing that we take so many things for granted! Yes, Aavin has been my milk supplier for nearly twenty five years! Occasionally, I have received a leaking sachet. Otherwise, the service has been predictable throughout, whether I was buying more milk during my son’s growing up years or buying less milk now as we are growing older! During my childhood, a milkman would come to our doorstep with his Sindhi cow, milk the animal in the traditional way and pour out the undiluted milk. During summer vacation, we visited our village often. There were several cows in a shed behind our village home and we were treated to fresh milk during holidays. Later, co-operative societies sprung up everywhere, and we were buying ‘society milk’ for a few years when I was at school. Then came the bottled milk; empty bottles were left out at the door step to be replaced by fresh milk filled bottles at dawn. Finally the milk sachet arrived, of course, to stay for a long time to come. All in all, Aavin has become an integral part of my life, initially for buying milk; later to buy ghee and butter, and the essential curds whenever I needed excess of it, as I normally prefer to set curds at home. During summer, we would treat ourselves to favored milk, lassi or masala buttermilk at one of the many Aavin outlets around. We would feast on Aavin milk khoa once in a while. Nonetheless, Aavin did not attract my attention except when an adulteration scandal broke out recently. The scam is under investigation and we hope that the perpetrators are brought to book. After that, it was back to business with the most predictable milk supply coming to my doorstep day in and day out. Recently, while stopping at an Aavin outlet for buying curds, I found an advert, which displayed information on “Aavin chocolates”! Chocolates indeed! I was pleasantly surprised to learn about this new product and bought a few. Good chocolates, reasonably priced and delicious. Each one (45 gms) costing Rs 30/- only. As we bought the ‘Nutties’, the vendor told us that there are more varieties available. So, I decided to visit Aavin website – http://www.aavinmilk.com/ – to check out on the chocolate varieties, and to my great disappointment, chocolates were not listed among the ‘Products’. However, Aavin sells varieties of ice creams, including the ‘new’ sugar free variety. Well, the site also has customer friendly features such as online milk card renewal and product price list. Aavin literally means ‘Cow’s (milk)’ and it is a conglomeration of co-operative milk societies functioning under the auspices of Diary Development Department, Government of Tamil Nadu. Interestingly there are 1210 women milk co-operative societies! Therefore, whenever we buy Aavin products we are in effect supporting our milkmen in the villages, who are part of these co-operative societies. Well, next time around I am going buy Aavin paneer and ice creams. I would strongly recommend Aavin ghee, one of the finest quality products available in the market. 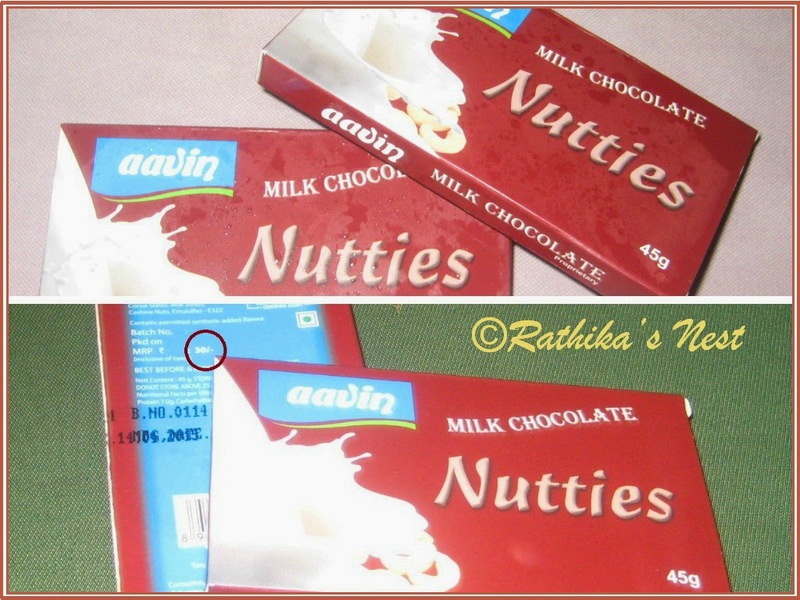 In the meantime, do check out on Aavin chocolates!